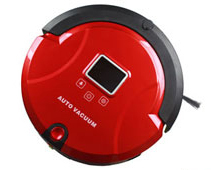 • Can auto-cleaning and auto-charging ,before the battery’s power run out, the cleaner will search the station and charge automatically. • Charging time can be set to clean at a certain time any day /some day all days of each week. • With stair avoidance sensors for avoid the cleaner falling down. • With non marring bumper (when meet barrier, it will rebound, but work still). • With touch-sensitive sensor to get out of the tight places, such as sofa, bed and more. • With virtual wall (if you need clean one room/a certain area only, you may open the virtual wall, the cleaner will never go out the room/area). • With wireless emote controller, you use it to select the cleaning speed ,set cleaning time, speed, docking and timing cleaning. • With mop for wet cleaning the floor. • With UV lamp to kill the bacteria on the floor. • Low noise only about 52dB. • Size is only 32 (diameter) x 8.7cm. • Auto charging station x1. • Extra side brush x2. • Docking station sticker x1.